Notre Dame enters this Sugar Bowl battle with LSU focused on ending the program�s eight-game bowl losing streak, which dates back to the 1994 Cotton Bowl where the Irish recorded a win over Texas A&M. Meanwhile, LSU is one of the hottest teams in the nation, as they have won their last six games to earn a BCS bowl bid. The Bayou Bengals will be making their seventh consecutive bowl appearance after winning 10 games in back-to-back seasons for the first time in school history. The Irish, meanwhile, return to a third straight bowl game and are looking for a better result after finishing last year with a 34-20 loss to Ohio State in the Fiesta Bowl. These two collegiate football giants will meet for the 10th time in their storied histories, with Notre Dame maintaining a slim 5-4 edge in the series. The only other bowl meeting occurred in the 1997 Independence Bowl where LSU registered a 27-9 win after Notre Dame dominated a regular season game one month prior. It's now time to take an in-depth look at how these two programs matchup in early 2007. Notre Dame enters this game after finishing the season on a sour note with a 44-24 loss to Southern Cal. Prior to the loss to USC, Notre Dame had won 8 consecutive contests following their 47-21 loss to Michigan in September. The most impressive win on the year for Notre Dame was a 41-17 rout of Penn State in the second week of the season. The Irish won five games over teams competing in the postseason, while LSU recorded four wins over fellow bowl competitors. The Tigers will make the short trip to New Orleans, looking to earn their seventh straight win to cap off an excellent season. LSU played a difficult road schedule this year, as they faced four teams away from Baton Rouge who were all ranked in the nation�s top ten at the time of the game. The Tigers earned a split of those four games, losing at Auburn and Florida while winning at Tennessee and Arkansas. 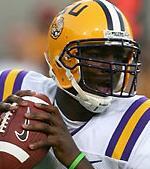 LSU is led by QB JaMarcus Russell who tossed 26 touchdowns while passing for 2,797 yards and completing passes at an impressive 68.5% rate. Russell focused downfield for WR Dwayne Bowe, who led the Tigers with 60 receptions for 912 yards and 11 touchdowns. The stars on the Tiger defense are DT Glenn Dorsey, a first team consensus All-American and a dominant force on the defensive line, and FS LaRon Landry, also a first team All-American who has started 47 consecutive games, a fierce hitter who leads the team in tackles. For the Irish, the offense begins with the third place Heisman finisher, QB Brady Quinn, who finished the season with 3,278 yards passing and 35 touchdowns versus only five interceptions. Quinn had two top targets to catch his aerials in WR Jeff Samardzjia, who hauled in 70 catches for 958 yards and 11 touchdowns, and WR Rhema McKnight, who had 64 catches for 885 yards and 15 touchdowns. The Notre Dame defense is directed by S Tom Zbikowski, the field general of the Irish stop troops who also is an excellent punt returner. Although WR Dwayne Bowe receives the majority of the publicity, Craig Davis and Early Doucet are just as crucial to the LSU offense. Davis has caught a pass in 34 straight games and finished the season with 52 receptions for 786 yards and 4 touchdowns, while Doucet is also a major threat as a punt returner and ended the season with 10 touchdowns. Glenn Dorsey was the main man on the defensive line, but DE Tyson Jackson let the team with 8.5 sacks. For Notre Dame, WR�s Samardzjia and McKnight were assisted by the excellent play of TE John Carlson, who is a major threat in the middle of the field as he hauled in 54 Quinn passes this season. On the defense, MLB Maurice Crum will be key in this game after he led the Irish with 92 tackles, and DT Derek Landri must play a key role in pressuring Russell as DE Victor Abiamiri gains the majority of attention from the LSU offensive line. In his second season at the helm of Notre Dame is Charlie Weis, who has directed the Irish to a 19-5 record in that timeframe. Weis graduated from Notre Dame in 1978 and came to South Bend after holding the position of New England Patriots offensive coordinator from 2000-2004, a span that saw the Patriots win three Super Bowl titles. In addition to his time at Notre Dame and New England, Weis also coached at the University of South Carolina, Franklin Township High School, and with the NFL�s New York Giants and Jets. Also in his second year is Les Miles, who took over at LSU following Nick Saban�s departure to the Miami Dolphins. Miles joined the Tigers after spending four years as the head coach of Oklahoma State where he recorded a career record of 28-21 as his Cowboys reached three bowl games. In his two years with LSU, Miles has won 21 of 25 games, winning the Peach Bowl last year and reaching the Sugar Bowl this season. In addition to LSU and Oklahoma State, Miles also coached at Michigan, Colorado, and with the Dallas Cowboys. [#1] A huge key in this game is how the Notre Dame defense fairs in slowing down the LSU offense, especially Jamarcus Russell. The Tigers enter this game with the nation�s 18th ranked total yardage offense at 404 yards per game, and the 10th ranked scoring offense at 33 points per game. One area that the Irish really struggled in this season was slowing down opponents' passing games. Notre Dame DE Victor Abiamiri must get to Russell, and when he does, he must actually bring him to the ground as Russell is a big man and very difficult to tackle. Russell has grown quite comfortable in tossing passes with defenders wrapped around his legs. If the Irish are unable to pressure Russell and knock him down, he will find his three talented wide receivers in the open field all night, as the ND secondary will have trouble maintaining coverage for an extended period of time. [#2] The Notre Dame offensive line versus the powerful LSU front seven provides another interesting matchup. The Irish front has been average this season, allowing 92 sacks and providing barely enough time for Quinn to find Samardzjia, McKnight, and Carlson down the field. The Tiger front is quite similar to Michigan�s, and the Wolverines were able to overwhelm Notre Dame�s line and totally shut down the Irish rushing offense, forcing Quinn to throw the ball 49 times. A critical matchup will be Irish freshman LT Sam Young who will face off with LSU DE Chase Pittman, who finished second on the team with 5.5 sacks. If Quinn does not get time in the pocket, he will be forced into a short passing game where the talented LSU secondary will be able to eliminate the big play capability, a huge key to Notre Dame�s offensive success this year. [#3] With all the attention being paid to the QB�s and WR�s in this game, whichever team can establish the running game assumes a huge advantage. Neither of these teams had an easy time generating a powerful rushing attack all season as both rely heavily on the pass as the running game is used sparingly. For Notre Dame, if their defensive line and linebackers can contain the Tiger ground game, the safeties will be able to sit back in coverage and provide needed support against the three LSU wide-outs. The Tigers use a rotation of Keiland Williams, Jacob Hester, and Alley Broussard, with Hester leading the way with only 415 yards on the season. LSU was held below 100 yards rushing on three occasions this year, in their losses to Auburn and Florida, and in their 23-20 tight win over Mississippi. As that statistic demonstrates, if the Irish can keep the Tigers in check on the ground, they have a great shot in this game. One area that could likely play a key role in deciding this game is the kicking game, and neither team is particularly strong in converting field goal attempts. Notre Dame has struggled all year in getting consistent production from their kicker, Carl Gioia. Gioia missed 5 extra points on the season and only converted on 8 out of 12 field goal attempts, with no successful kicks from beyond 40 yards. LSU has not been any better than Notre Dame, as Colt David has only connected on 6 out of 10 attempts with a long of 45 yards. David did hit on 3 of 6 attempts from 40-49 yards and did not have a single attempt of a field goal between 30-39 yards on the year. Both head coaches lack confidence in their kicking game, and the result could be numerous attempts to go for the conversion on 4th down instead of attempting a field goal. An interesting stat to keep an eye on in this game will be which team is more successful in converting on 4th down, as the higher percentage of successes may very well lead to victory.